freestompboxes.org • View topic - Converting discrete op-amp into chip? Converting discrete op-amp into chip? I want to make a version of the Boss OD3 with an IC opamp instead of the discrete opamp gain stage. But since the OD3 opamp uses Jfets and most chips use BJT i'm not sure how to do this conversion. Re: Converting discrete op-amp into chip? Did you mean the TS808? Because i'm not familiar with the TS8. It's not exactly the same. Do you have a schematic of the TS8? I can't seem to find one. This is the ts8 circuit. What you have to consider is replace the "clipping amp". 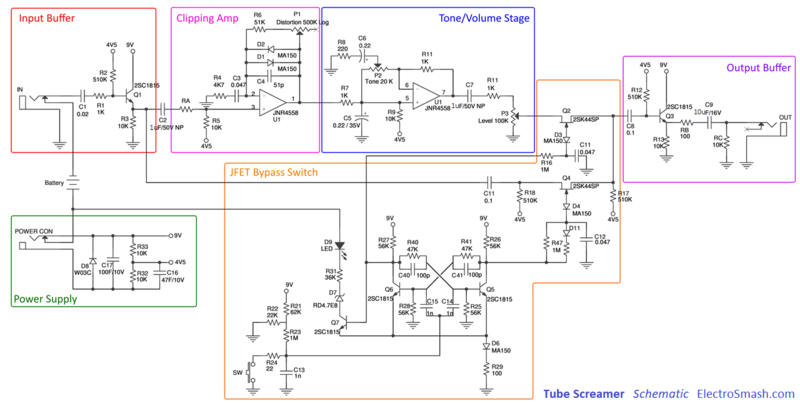 So this is just the standard TS9\TS808 schematic i'm familiar with. Do you refer to the TS808 as the TS8? So I think i'm starting to figure it out. Looking again at the OD3 schematic- Q13, Q14 and Q1 form the op amp, before that there is a notch filter (R34, R35, R48). Q8 is the input buffer and Q9 is used for switching. So what is the purpose of Q10? ?